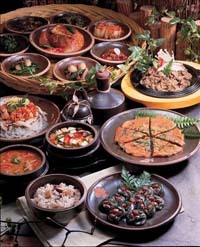 Korean food is unique in its taste, preparation and the way it is served. It cannot be served with normal Western style dinnerware sets but requires a Korean style table setting (Ban-sang-gi - 반상기). 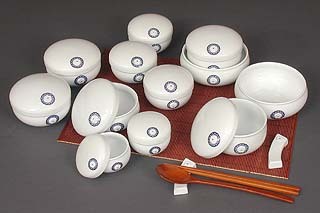 We are now offering five styles of Korean style dinnerware sets; three with a lovely violet design and two from the ceramics of Lee Sang Moon (one style shown above), the best known appraiser of Korean antiques, who appears on the antique appraisal show, Jin-pum, Myeong-pum (Real Antiques, Famous Antiques). His line of ceramic table sets are praised for their subtle beauty and style reminiscent of Chosun Dynasty celadon. Look for more sets in red, cream, brown and celadon colors next month. We are also offering five new styles of jewelry ranging from a Floral Coral & Pearls earring set with tiny flowers carved from orange coral to a set of jade earrings in the shape of leaves that recreate the beauty of nature in jewelry you can wear. See all the new dinnerware sets, jewelry and other new items here. The beauty of Korean food is not high-priced fancy restaurants with ironed-white tablecloths and waiters in tuxedos; but the little place around the corner where the woman that looks like your mom (if you have a Korean mom) makes the best Kim-chi-jji-gye you've ever had. In other words, simple food prepared with care by people who know food, and love to make it. Unlike Western food, Korean food is meant to be shared; the main dishes are served in big stew pots and everybody either eats right out of the same pot or spoons some into small soup bowls in front of them. 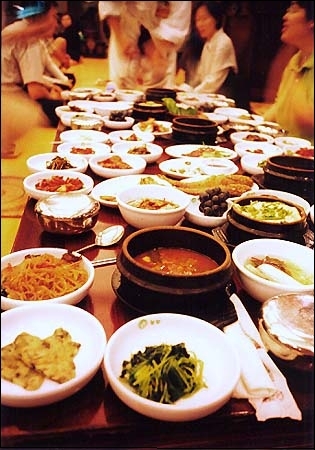 Around the main dishes are dozens of little dishes containing kim-chi of various kinds, and a myriad of other side-dishes which are an integral part of the meal; as shown above. Finally each place has a bowl of rice in a covered bowl which is eaten with the main dish and the side-dishes. To serve all those side dishes, the -ban-sang-gi (반상기) or dinnerware set is used. Dinnerware sets consist of rice bowls, usually covered, sometimes not, low soup bowls, and a myriad of small, low bowls, sometimes covered, and various sized small plates to place all the varieties of side-dishes. Because of all the side dishes served with a Korean meal preparation is time consuming and require a number of different recipes for each little side-dish. Food preparation for a family usually falls on the shoulders of the wife who generally spends hours preparing meals for a family while those that live alone, often eat out since making many side-dishes for one person is not always practical. Therefore, each neighborhood has a number of small mom-and-pop restaurants where workers often eat for lunch; businesses in the area also order take out and the proprietor carries the aluminum tray with the meal on it covered in newspaper on to the business and then picks up the tray later - take out at its best! Evenings, those who don't feel like cooking, or for whom cooking for one is impractical and young people also go to these kinds of places to eat. Restaurants that serve meats such as bul-go-gl, gal-bi (shown at right), and the like, are popular places for people to meet, and have a few drinks with the meal. Drinks with meat usually are so-ju, a clear rice wine drink similar to Sake, or mak-geol-ri (막걸리) a white unrefined rice wine served cold. Our favorite! Dwen-jang-jji-gae (된장찌개): Is a stew made of a soybean paste and anchovy stock it is typically served as the main course or served alongside a meat course. It contains a variety of vegetables, shellfish, and tofu. It is normally served in a stone pot, still boiling when it arrives at the table. Kim-chi jji-gae (김치찌개): Is a stew made with kim-chi, pork, and tofu. It is a common lunch meal or compliment to a meat course. It is normally served in a stone pot, still boiling when it arrives at the table. Bul-go-gi (불고기): Thinly sliced beef marinated in a mixture of soy sauce, sesame oil, garlic, sugar, scallions, and black pepper, cooked on a grill (sometimes at the table). Bul-go-gi literally means "fire meat." Variations include pork (dwae-ji bul-go-gi, 돼지불고기), and chicken (dak-bul-go-gi 닭불고기). 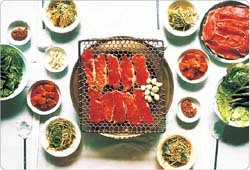 Gal-bi (갈비): Is pork or beef ribs, cooked on a metal plate over charcoal in the centre of the table. The meat is sliced thicker than bul-go-gi. It is often called "Korean barbecue" along with bul-go-gi, and can be seasoned or unseasoned. A variation using seasoned chicken is called dak-gal-bi. Sam-gyeop-sal (삼겹살 - our favorite): Thick slabs of bacon grilled on a grill or over open charcoal. Commonly grilled with garlic and onions, dipped in sesame oil and salt mixture and wrapped with ssam-jang (a somewhat spicy bean paste based sauce) in lettuce. Gal-bi-jjim (갈비찜): Is made by made by brazing marinated gal-bi (beef short rib) with diced potatoes and carrots in soy sauce (gan-jang). Tteok-guk (떡국): Tteok means rice cake and it is boiled with broth and some vegetables to make a delicious soup. Man-du-guk (만두국): Is the same as tteok-guk (above) but without the rice cake and with dumplings instead. A version with both the dumplings and the rice cake - tteok-man-du-guk - is also available. Galbitang (길비탕): Is a hearty soup made from short ribs. Samgyetang (삼계탕): Is a soup made with Cornish game hens that are stuffed with ginseng, hwang-gi (황기) Astragalus. First put water and 1/2 cup 멸치 (myeol-chi) in a saucepan and boil for 5 minutes. Then put in 1/3 cup diced onions, 1 small potato, 1/2 medium zucchini, and any other vegetables, and cook 5 minutes. Then put in 1/4 cup 된장 (dwen-jang) and 1/2 tsp ground red pepper. Cook 5 minutes and when the vegetables are cooked, put in 1 cup sliced tofu, and green onions. Serve with glutinous rice, dried laver, and side dishes. This sauce can be used for either gal-bi (beef or pork), LA gal-bi or bul-go-gi; I would recommend bul-go-gi as the meat should be easier to prepare. For beef or pork gal-bi take a small rack of short ribs and have the butcher cut it in half lengthwise so you have short-rib bone pieces about 3-4 inches long take the meat off most of the bones and marinate it as directed leaving about 3 -4 bones for each person. This is best grilled. For LA gal-bi take the short-rib rack and cut it lengthwise in about 1/3-1/2 inch slices so you have a long strips of meat with 3-4 bone cross sections in them. Marinate and grill or fry. Bul-go-gi, the easiest of the three is just beef (beef round tip, top-round, bottom-round or whatever you want to use) sliced very thin (about 1/16 inch) and cut into large bite size pieces. If it's sliced thin enough it is almost shredded and falls apart into pieces when you cook it. With the bul-go-gi I like to add a medium onion or green onions cut into peanut sized pieces, sliced mushrooms or black olives (not too many), or any combination of the above. If you are using very tough meat add a minced Kiwi fruit to the marinade to tenderize it. When you eat bul-go-gi you are supposed to have quite a few side dishes but you can get by with just some good kim-chi. A big supermarket should have it. Look for the fresh looking stuff with a lot of white cabbage visible in the jar. When you eat it you should take a small lettuce leaf, put in a wad of beef, a dab of bean paste and a bit of rice, wrap it up and pop it in your mouth (the kim-chi is eaten on the side). But we often just fill a plate with beef and rice and dig in. Email exchanges are becoming increasingly unreliable due to the various efforts to thwart unsolicited mail. If you would like to ensure delivery of our messages to you, we recommend you add our domain � Korean-Arts.com - to your list of acceptable correspondents (on Outlook Express: Tools > Junk Mail Filter; on Netscape Communicator: Edit > Message Filter). Copyright � 2002-2009 Korean-Arts.com All rights reserved.